All the aspired bankers get ready for yet another South Indian Bank Recruitment 2019 opportunity. Every year, following the placement and departmental requirements, the organization is going to introduce new vacancies for the current year. The posts that are to be filled will be Clerical and Probationary Officers. Get more details in the following segments stated as per the job notification. The financial organization named South Indian Bank releases regular recruitment notices stating about different PO and Clerk level vacancies. Like every time, the banking firm is going to conduct the national level placement process. The roles specified in this web post are as per the previous notifications and publicized information. Going through the internet search, aspired candidates need to know what roles to be taken are Probationary Officer Clerk Other posts include the clerical cadre. The last date for online application is set to be 30.12.2017 tentatively. Applicants must be from an Indian region. Applicants must have a certified degree in B.Tech/BE in Computer Science, Electronics & Communication, Information Technology, Electronics & Electrical, Electrical, Instrumentation etc. Candidates having their MCA, M.Sc (IT), or M.Sc Computer Science done with a minimum passing percentage of 60% from a recognized university are also eligible to apply. Work Experience will be a plus point for the applicants. Kindly, mention all your previous work details. Candidates opting for Clerical posts need to have their graduation completed from a recognized university or institution. There is minimum passing percentage required for the clerical cadre posts. Candidates from any stream can apply. For PO Clerk posts an applicant’s age must not be more than 26 years as on 31.12.2017. Age relaxation is given to the candidates belonging to the reserved categories upto 5 years. Candidates belonging to the General and OBC Categories need to pay Rs. 600/-. Applicants from the SC/ ST categories have to submit Rs. 150/- through a payment challan at any of the CBS branches of South Indian Bank. After complete registrations, contestants will be called for a Written Test/ Group Discussion & Personal Interview. The final selection will depend on the overall performance of an applicant evaluated collectively. The final selection will be decided only by the selection committee members. The monthly salary will be deduced considering TA, DA, HRA, and Miscellaneous allowances. Log on to the official web portal assigned by the organization named as, “www.southindianbank.com”. Choose the career tab and look for the recent notice. Read the post details very carefully and start applying online. Submit the form data after reviewing it properly. Take a printout of the application format and submit the fee via a challan generated. 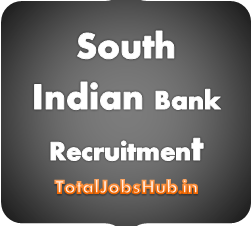 The details that are dispatched in the above parts, is as per the upcoming South Indian Bank Recruitment 2019 Clerk PO Notification. Kindly, note that this is unofficial data. More information is to be available after the disclosure of the notice. Do stay tuned for the upcoming updates. Start applying afterward using the verified link below.